I’m on one of my periodic sojourns to Mexico City, so this will be a “Cocina de Tom” version of Tom’s Kitchen (see the first one here). Now is a particularly glorious time to be in central Mexico, because the first mangos of the season have just hit the markets. To me, mangoes are never sweeter or more vividly flavored than when they first come in. 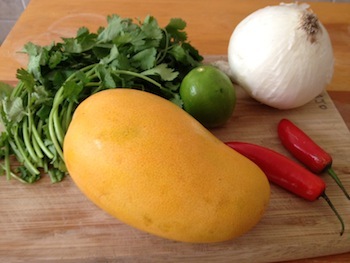 I’m so revelling in them right now that there’s no way I can resist featuring mangoes in a dead-simple addictive salsa, inspired by the special all-mango menu at the great Azul Historico in downtown Mexico City. This spicy concoction can either be scooped up with chips or served as a condiment with grilled meat, fish, or, yes, even tofu. Now, for US readers trying to eat as much as possible from food grown within their own regions, mangoes may seem an elaborate indulgence. For you, I’ve shown below how to tweak the recipe for peaches, which will be coming in season soon enough across much of the US. Note: This recipe makes a soup bowl’s worth of salsa—enough to to provide a kick to four people’s dinners, or a chip snack for two. It is easily multiplied. Combine the first four ingredients in a bowl, plus a pinch of salt, about a quarter of the minced chile, and a squeeze of the lime. Stir. Taste. What you’re looking for is sweetness balanced by a bit of sour from the lime cut through with a good blast of chile heat. The salt is just there to magnify and blend the other flavors—the salsa shouldn’t taste salty. Add increments of chile, lime, and salt until it’s just right for you. When I’m making this salsa as a condiment for other food, I tend to make it on the spicy side; while when I’m intending it as a snack, I make it a bit more mild, so as not to enchilear (spice out) my friends—unless, that is, I’m trying to limit their consumption of it to save more for myself.